This is not an emergency, but can be a little uncomfortable or embarrassing for the braces-wearing patient. It is easily fixed with a piece of dental floss. Try tying a small knot in the middle of the floss to help remove the food. Or use an interproximal brush or toothpick to dislodge food caught between teeth and braces. Sometimes new braces can be irritating to the mouth, especially when the patient is eating. A small amount of non-medicinal relief wax makes an excellent buffer between metal and mouth. Simply pinch off a small piece and roll it into a ball the size of a small pea. 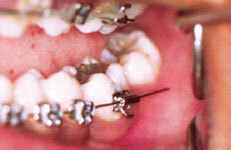 Flatten the ball and place it completely over the area of the braces causing irritation. The patient may then eat lunch more comfortably. If the wax is accidentally ingested it’s not a problem. The wax is harmless. It’s normal for a patient to have discomfort for a day or two after braces or retainers are adjusted. But it can make eating uncomfortable. The discomfort is both normal and temporary. Soft foods are encouraged. Have the patient rinse the mouth with warm salt water. If the patient is allowed to have over-the-counter pain relievers, acetaminophen or ibuprofen may be effective. Some patients are susceptible to episodes of mouth sores. 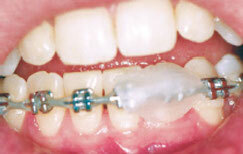 While braces do not cause them, they may be precipitated or exacerbated by an irritation from braces. One or several areas of ulceration of the cheeks, lips or tongue may appear. This is not an emergency, but may be very uncomfortable for the patient. Prompt relief may be achieved by applying a small amount of topical anesthetic (such as Orabase or Ora-Gel) directly to the ulcerated surface using a cotton swab. Reapply as needed. Occasionally the end of a wire will work itself out of place and irritate the patient’s mouth. Use a Q-tip or pencil eraser to push the wire so that it is flat against the tooth. If the wire cannot be moved into a comfortable position, cover it with relief wax. (See Irritation of Cheeks or Lips above for instructions on applying relief wax.). If the problem can not be relieved, please contact our office so our experienced dental assistant can help to relieve the problem. If the bracket is off center, the adhesive may have failed. Please call our office, we can determine the course of action. If the loose bracket has rotated on the wire and is sticking out, you can do a temporary fix to alleviate discomfort and prevent further damage. But take care to prevent swallowing or other injury. To put the bracket back in place, use sterile tweezers to slide the bracket along the wire until it is between two teeth. Rotate the bracket back to the proper position, then slide it back to the center of the tooth. If the braces have come loose in any way, please call our office to determine appropriate next steps. 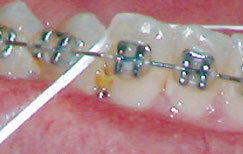 Tiny rubber bands or small, fine wires, known as ligatures, hold the wire to the bracket. If a rubber or wire ligature is lost, please call our office so we may advise whether the patient should be seen.